The U.S.S. Enterprise is ordered to pick up Ambassador Robert Fox, who is headed to planet Eminiar VII on a diplomatic mission. Upon arriving at the planet, the ship is warned away. Beaming to the surface with a landing party, Kirk and Spock are met by a young woman, Mea 3, who tells them that Eminiar VII has been at war with its neighboring planet, Vendikar, for over 500 years. Mea 3 takes them to the council chambers where they find banks of computers. Eminiar's head council Anan 7 informs them that the two planets have learned to avoid the complete devastation of war because computers are used. When a "hit" is scored by one of the planets, the people declared "dead" willingly walk into antimatter chambers and are vaporized. Anan 7 further tells Kirk that his ship and all the crew aboard her have been declared casualties and will be executed. 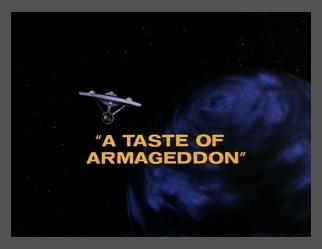 When Kirk flatly refuses, the landing party members are taken prisoner. The council members are unable to convince Scotty, in charge of the U.S.S. Enterprise, to lower shields without a direct order from Captain Kirk. Meanwhile, Ambassador Fox has beamed to Eminiar and is also taken prisoner, marked for death. Kirk and Spock escape and gain the council chambers where they destroy the computers. Kirk tells the council members that they have made this war too easy for themselves and that they will truly experience the horrors of war if they do not learn to make peace first. Ambassador Fox volunteers to stay behind and negotiate a peace between the neighboring planets. This is something to brag about?? They play a type of video game where people actually die! A very warped way of looking at it. He says it so matter-of-factly. Scotty say this line of dialogue. Hold that temper, Mr. Scott!! Well then, do your job man!! is if all they have are morons running the show? I do believe our captain is bluffing a bit here. How did the ambassador get to the planet? it wasn't!! So, how did Fox get to the planet? credits list her as "Tamula." No big deal, I just thought I'd mention it. a fake General Order used as a bluff by Kirk. Kirk makes things happen, he's a risk taker. It's one of the qualities of a great leader. Yes, I'm aware it's a TV show. He's absolutely right about that!